Trees are wonderful additions to any property. They provide clean air, shelter and food for wildlife and so much more. 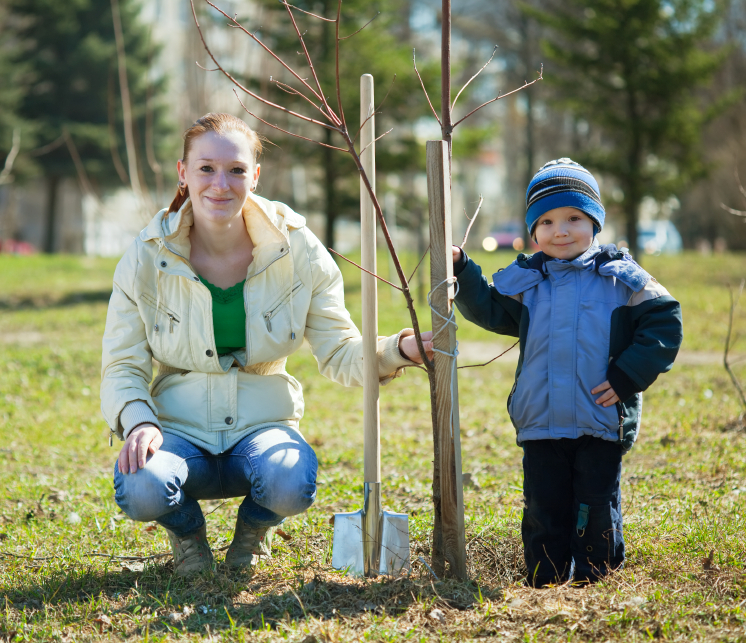 Once you’ve decided on what kind of tree you want, follow these steps to ensure it’s a happy and healthy addition to your backyard. The best time for planting bare root trees is early spring (before the leaf buds open) or late fall (after deciduous leaves have fallen). Potted trees have a wider window of opportunity for planting, but try to avoid periods of extreme heat and drought and ensure that fall plantings allow enough time for adjustment before frosts start. Choose early mornings, evenings and rainy days to do the work. Whatever you do, avoid planting seedlings under the hot sun. Congratulations on your new bundle of joy! Before you dig a hole, it’s important to take care of this lovely living thing properly. That means keeping the roots moist at all times, but don’t immerse them in water. If you must store them, do so in a sheltered, cool, shaded spot. Bare root trees and seedlings should be planted as soon as possible. In the case of seedlings, remove a patch of sod about three to six centimetres wide and dig a hole three to 10 cm deep for each one—just deep enough to allow the root of the plant to be buried up to the root collar (where the roots join the stem). There should be enough space to spread the roots out without bending or curving them around. In the case of larger bare root trees, you can build a cone-shaped mound in the centre of the hole that will allow you to spread the tree's roots out over the mound. For large plants, the hole you dig should be the same depth as two to three times the width of the root ball. Allow at least 15 cm of extra space around a root. Leave a radius of at least one metre between plantings. You’ll want to consult with an expert on the spacing required between each species of tree or shrub. Once the hole is dug, fill it with water before placing the tree in it, so the roots get a good drink. Use the soil that you removed from the hole to fill it back in. Don’t forget to break up any hard-packed clumps and add the soil gradually. Gently tamp the soil or add water to eliminate any air pockets. Whatever you do, don’t compact the soil! Add more soil and water again. This step ensures that air pockets are filled with healthy soil. Do not press very wet soil or it will become too compacted. If you can, water the tree immediately and slowly, letting it soak in before adding more. You’re only going to want to stake your tree if it’s absolutely necessary. So if it’s very windy, it might be a good idea to stake the tree. If you decide to do that, be sure to use soft, wide material strips and tie the tree loosely to allow some movement. Gradually loosen the guy wires so the tree can develop its own strength. The following weeks are critical to your tree. You’ll want to water the tree regularly so ensure you water long enough for the water to make its way all the way down to the root ball. 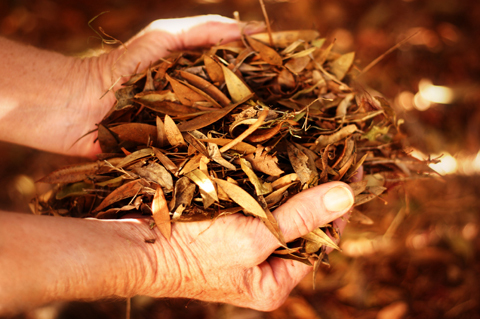 Adding a layer of wood chips or other mulch material around the tree or shrub will keep the tree’s roots cool and moist, prevent soil erosion and weed growth and protect the trunk from lawn mowers and trimmers. The tree should be mulched as far out as its drip line but be sure to keep the mulch 15 cm back from the tree trunk to discourage access by mice. To break up large areas of mulch, add forest understory plants such as Solomon’s seal, ferns, wild ginger, or foamflower. If you take care of your new tree until it is able to take care of itself, it’ll return the favour by providing you with shade and cool air on hot summer days and shelter from wind on those chilly winter days. Ensure that your tree has adequate water for the first few years. Start with frequent watering and gradually lengthen the time between watering. Watering requirements will vary depending on the size of the tree, soil type, time of planting, and amount of rainfall. Generally, the smaller the tree at planting the more quickly it will adapt. Ask your supplier for advice relevant to your area and the particular tree. Otherwise you can leave the tree be for the most part. Only prune the tree to remove dead or broken branches. Protect your trees and shrubs from any grazing animals or human damage by surrounding them with fencing. Mesh “socks” or covers can be placed over the leading shoots of young conifers to protect them from grazers. You can also protect the trunks of your deciduous trees from rodents over winter by encircling them with tree wrap or chicken wire. You can also use a length of plastic corrugated and perforated drain pipe (available at hardware stores); however, ensure that the width you choose is wide enough to leave space between the tree and the pipe. Block plantings are several rows of trees and shrubs planted parallel to each other. They are especially appropriate for backyards prone to erosion problems.